I can't believe I'm writing another celebrity obituary... Y'see, when I started this clumsy excuse for tireless movie-related whining I made a pledge to veer stealthily away from anything that focussed on the celebrity aspect of Hollywood. I was in it for the art! And Batman flicks... But, I suppose any true credibility I could have once declared was officially null when I wrote 1200 words on the impending Mummy 3. So, dignity be-damned, I am here tonight to say a few words about a beloved icon of cinema that passed away last night. I'm talkin' bout the Chuck! Many young people growing up are exposed to certain idols of olde Hollywood which they forever associate with the era's past. Whether it is Judy Garland, Jimmy Stewart or Rory Calhoun, there is an odd sense of magic about them. They lived in a time we, as ignorant youngsters, have no comprehension of. 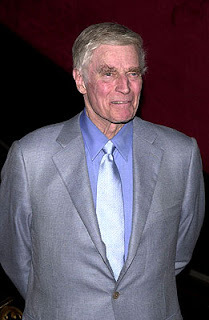 For me, that man was Charlton Heston. What's funny though, is that while the movie (at the time) wasn't a favorite, I had an odd amount of respect for Mr. Heston. There was a seriousness about him that was also sort of inviting. He could be intense and still give off a weird twinkly glow from his eerily sharp blue eyes. 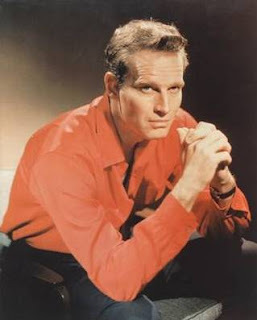 The man personified what I would consider "old movie guys", and yet had a sense of timelessness about him. Flash forward to now (Roughly 21 years later), I write this blog as an impassioned movie viewer, who lives and breathes the history and future of cinema. I've delved through the careers of untold classic actors, gaining great appreciation for so many that the "good ol' days" had to offer, and yet few project the mythical stature that Mr. Heston did. He was a man who brought authority and immeasurable weight to any project he did. Sure, it’s easy to cite his Oscar-winning performance in Ben-Hur, The Big Country, or his splendid work in Orson Welles' A Touch Of Evil (As a Mexican! ), and preach about his skills in understanding the nuances of his character's psychology. Heck, one could even go into depth about his breakthrough work in 1952's Oscar-winning The Greatest Show On Earth... 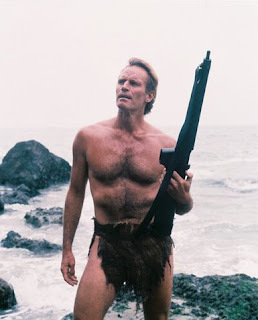 But that's not the Charlton Heston that I've grown to love over endless hours of movie-going. No, the Heston that means the most to me is the man who appeared in Planet Of The Apes, Beneath The Planet Of The Apes, Soylent Green, and Earthquake. While many actors would have slept-walked through these particular types of genre film, Heston stepped up to the plate and delivered ten-fold. He enhanced the positive qualities within those scripts and helped craft classic entertainments that would prove to outlive the majority of his "serious" work. What is sad, however, is that with his passing, we have one less classic Hollywood alpha-male archetype around. The age of self-improvement books, irony, and metro-sexuality have all but put a stake in the heart of the rugged type of masculinity that was once a driving force in entertainment. So, the passing of Heston, for me, also symbolizes the further vanishing of a beloved era of artistic achievement. 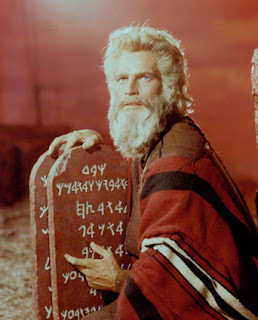 Heston was a man who worked hard, and fought for his beliefs no matter how controversial. His status as an NRA spokesman unfairly cast a pall over his later years. You show me an 80-year-old who doesn't hold stubborn conservative beliefs and I'll rethink my position on Batman Forever. So, I'd just like to draw as much attention to Mr. Heston's invaluable voice in promoting civil rights, as well as his outspoken opposition to the Vietnam War. No matter what he was fighting for he did it with complete conviction and unwavering confidence, and I don't think that is something to be flippantly dismissed. But aside from all that, he was an impassioned performer who changed lives through his work. He gave us a persona that we could root for not matter what the odds. He was effortlessly strong, while never failing to exhibit an emotional connection with the audience. He was one of the best of the old school Boy's Club, and probably one of the reasons I'm inspired to do what I do to this day. 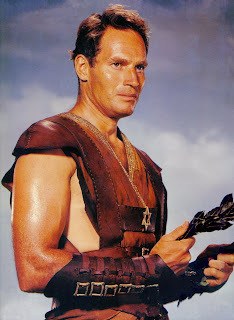 So, thanks for the memories, Mr. Heston, and I'll be sure to introduce my own children to one Judah Ben-Hur... Just like I was so many years ago. P.S. : Extra special thanks for your beyond brilliant cameo in Wayne's World 2. It's been endlessly quoted and pontificated over by my sister and I since 1993. "One perfect day on Gordon Street...."